It finally happened. Noelle. Is. Potty. Trained.!!! What a different world this is. 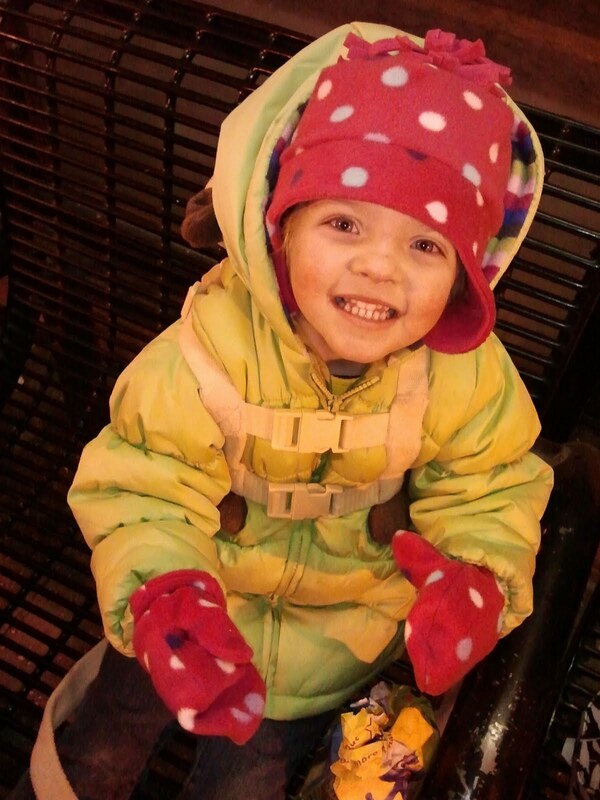 Here's the story: For several weeks we told Noelle that after Christmas there weren't going to be any more diapers. Telling her things way in advance really works, for other things as well. 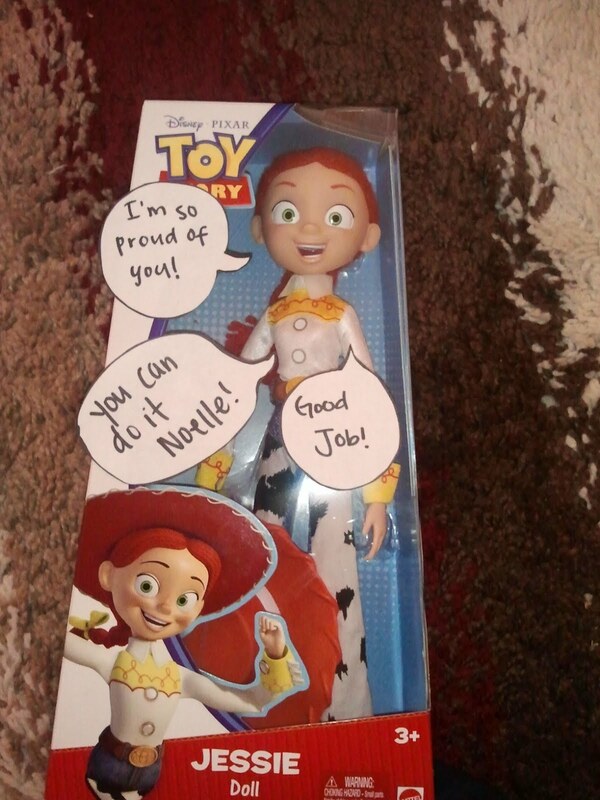 We also told her once she is fully potty trained she gets her Jessie doll. So we displayed it near the toilet as a reminder. She was really excited about that. We also told her after Christmas we were going to potty train her. So the weekend of New Years Eve (Friday-Monday), we decided to be hermits and stay inside and focus on getting this girl trained. Michael also had all four days off so that is why we chose that weekend. She had a few accidents on Friday and at the end of the day she said in a very sad tone "I'm all done." So I asked her if she wanted to try a diaper on. Little did she know that I had saved one of Mikey's size 2 diapers. So we had her try it on and she realized that it didn't fit her. Well that totally worked because after that she went potty like three times before bed. Seemed that she had held it for quite a while. After that she did so well. A few accidents here and there but pretty much she was potty trained in like two days. I'm so glad I didn't push her earlier. It's been WONDERFUL! 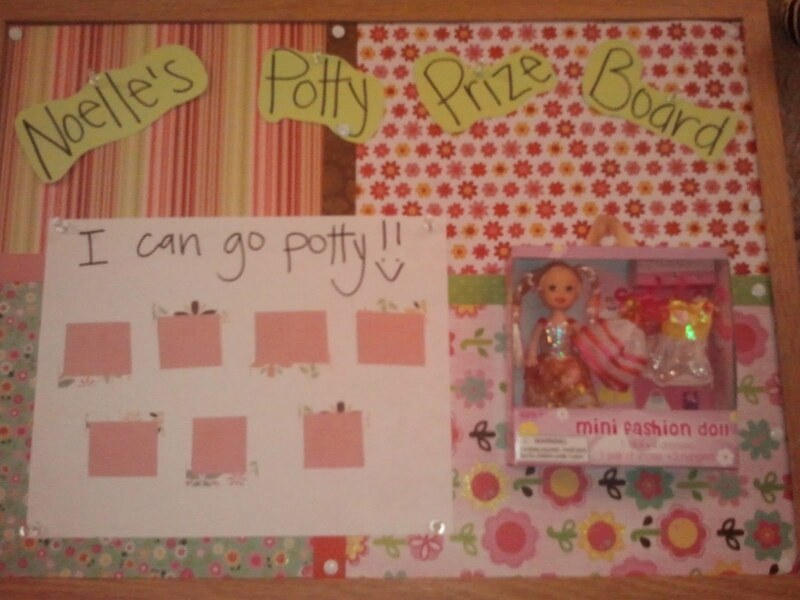 We also did this potty prize board that totally has worked. She goes a number of times, puts stickers on a chart and then gets a prize. Although if she wasn't ready I don't think anything would have worked. Also lots of prayers probably helped a little :). 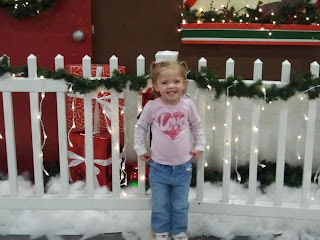 I really had hoped that she would get potty trained before she went into sunbeams and it happened the day before. I'm just grateful and want to let any moms out there know that being three and not potty trained is okay. It will happen when they are ready. Thank you everyone for your advice and comforting words about the whole situation. Phew, glad that one is over. 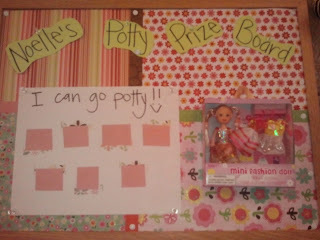 Our potty training magic tools. 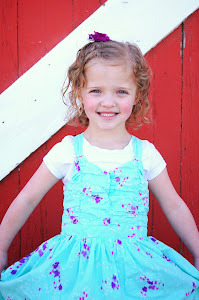 Noelle has been a potty training rock star. I got a little ambitious this Christmas. I don't regret doing any of these projects at all I just wish I would have started earlier so I didn't have to work on them up until the day before Christmas Eve. Noelle sure loved them and that made it worth it. Princess Felt Mat.This was way fun to do. A friend and I had a craft night once a week and worked on it. It took a while but probably wouldn't have if we didn't talk and watch tv. It was fun! the tutu I made Noelle. Wish I would have done darker, brighter colors but oh well. You live and learn right? She needed a tutu. We did not make this from scratch. This used to be my old cabinet/cupboard when I was a little girl. My Grandpa O'driscoll made it for me and it's been in my parent's basement for a while. I was really excited that it was there and really wanted to redo it for Noelle. This is how it turned out. It's a little tall for Noelle but she still likes it and it will last her for a while. I love that Noelle is playing with something that I did as a child. 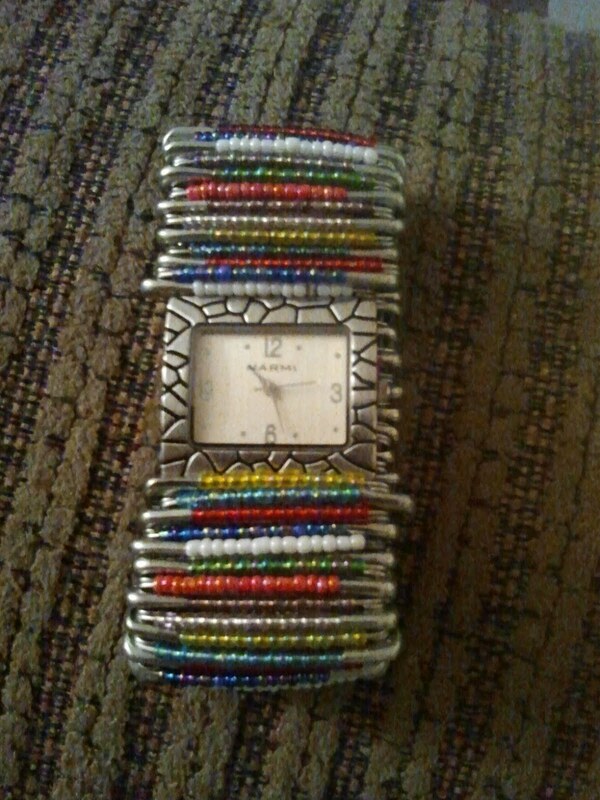 I made two of these watches. One for my mother-in-law and one for my mom. It took a while (those tiny, deceptive beads). But I liked how it turned out. Although the morning I gave it to my mom, it broke. So I guess I have to figure out how to make it a little more durable. 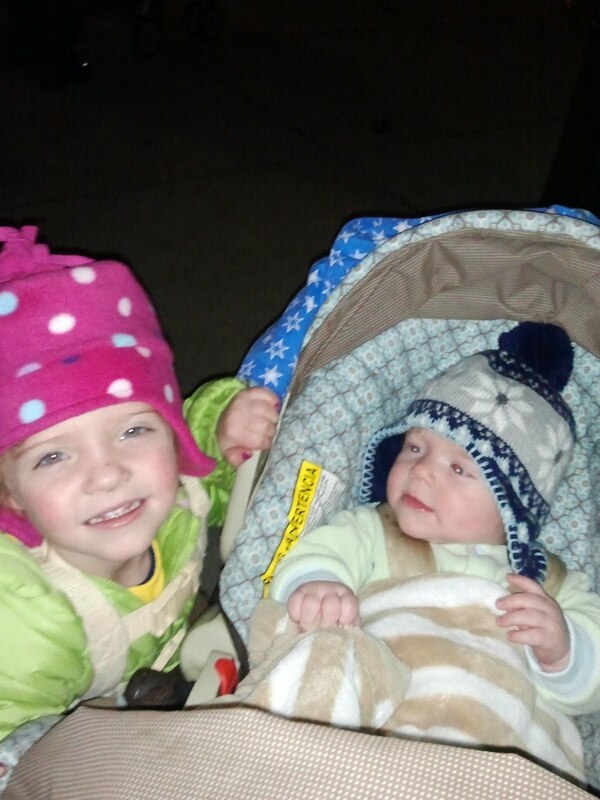 Tanner and Nina came to visit and we loved, loved, loved seeing them. Especially little Eric ;)! He's gotten so big and is so cute. 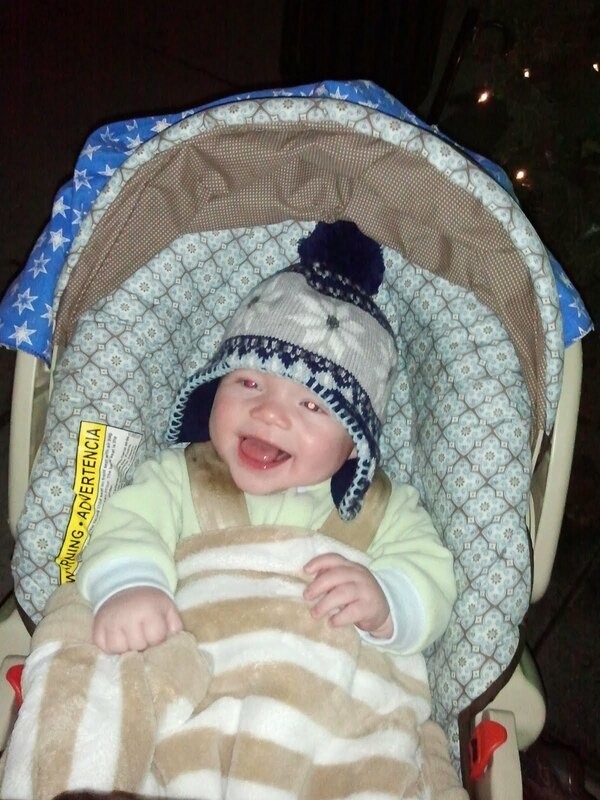 He is so much fun and I couldn't get enough of holding him. He preferred to move around though, rather than be in my arms. We wished we lived closer but we couldn't have asked for anything better then seeing this amazing family that we love so much. Noelle loves giving hugs and kisses and couldn't stop talking about how Tanner, Nina and Eric were coming to visit. Last year my mom bought this gingerbread house kit for my sister Taylor. She didn't care for it so she put it away. Well this Christmas my mom brought it out and thought Noelle would enjoy it. Well she was right. Noelle really had fun with it. And the candy wasn't even that stale ;). We started it at my parent's house and then finished it at ours. So fun. 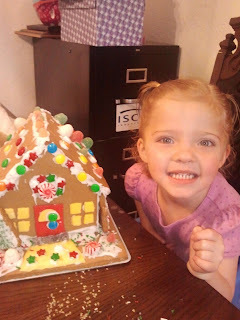 Maybe next year we will try to make ours homemade, we'll see. Thanks mom for the kit! I still have little cousins around and my grandma has a bunch of great-grandkids so we still do a " little cousin" Christmas party. This year we ate some yummy pizza, decorated sugar cookies, played musical chairs and opened presents. 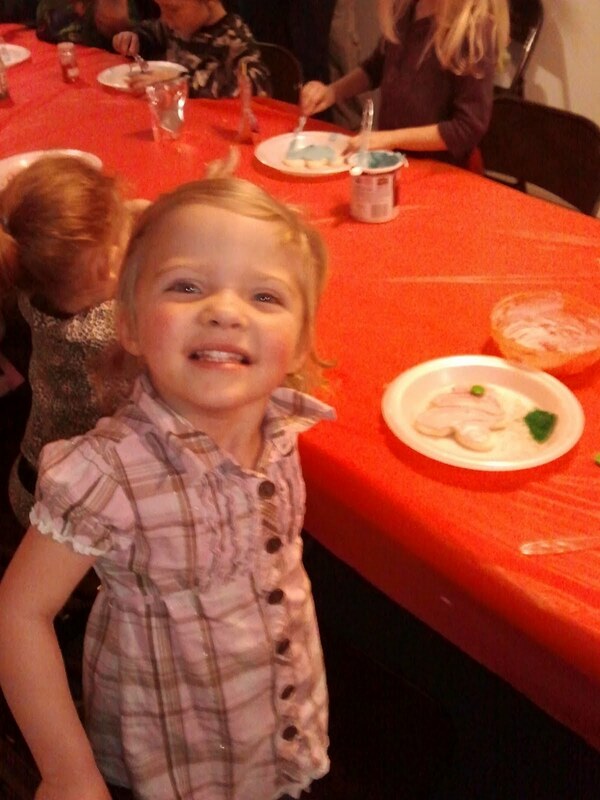 I only got pictures of Noelle decorating her sugar cookie and I'm so glad I did. She really had fun with it. She was so in to it and I just let her do whatever she wanted. Everyone draws names and Noelle got a barbie and barbie purse from her second cousin Taven. She loved it! This year we spent Christmas Eve with my side of the family. And we had tons of fun. First of all this year we decided that we were going to dress up in ugly Christmas sweaters. We went to the thrift store and couldn't find any Christmas sweaters. So we made our own. This was quite the adventure but we did it. I made four of them thank you very much. 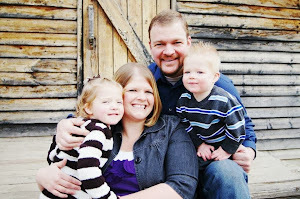 Although I just added little touches to Noelle's and Mikey's. Anyway, on to Christmas Eve. So we got there and had fun with everyone commenting on our sweaters. We took pictures and almost everyone changed their sweaters. Although I didn't get the memo that everyone was going to do that, so I walked around for a bit in mine. Then I felt awkward and changed into my lazy byu-i hoodie. 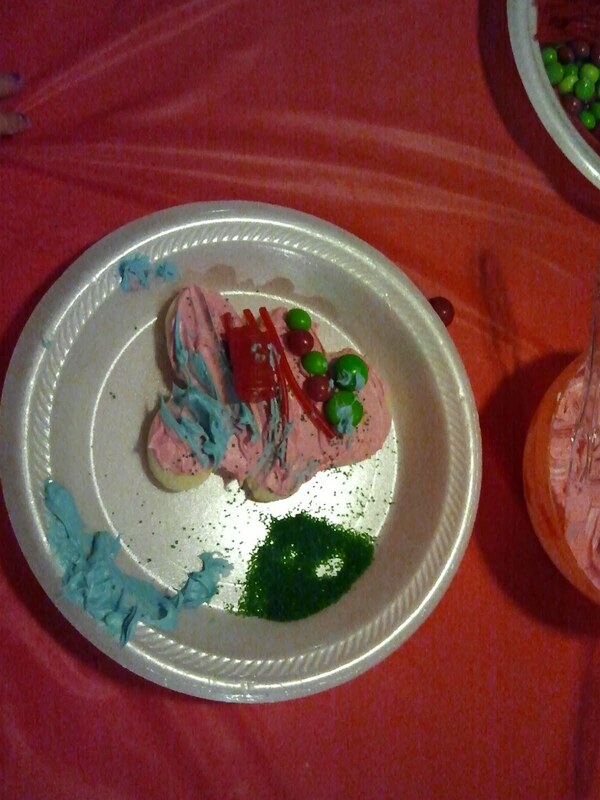 We ate some yummy food and then had the annual Christmas Even program that my grandparents put on. I love this and it really brings in the Christmas spirit. Noelle was Mary in the Nativity but she refused to wear anything on her head. 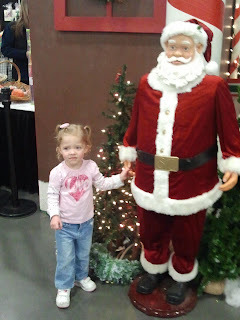 But I think what got her to do it was that she got to hold the "baby Jesus." It was so cute. Then my family does this crazy 12 days of Christmas. Let's just say there's a lot of noise and actions for each day and everyone is standing up and I'm not surprised that someone doesn't end up with a broken limb. But it's super fun and a tradition that's been going on for a while. Then there is the opening of the presents, which are pajamas for everyone under 18. It was such a fun night!! Our awesome sweaters. Unfortunately you can't see three of the four that I did. I'll have to put a picture of them up later. Noelle as Mary with the rest of the nativity. Aunt Nina and Mikey. Mikey is such a drooler. Christmas morning came and we actually had to wake Noelle up. Mikey was sound asleep so we didn't even bother him. This year was so fun for Noelle. And we loved it. We just couldn't wait to see Noelle's face. Unfortunately I didn't get any pictures of Noelle opening up presents at our house but that's okay because I really enjoyed being a part that morning with her and Michael. Mikey has really been enjoying his new toys as he's been so much more into everything. Before we headed out we got to skype with Michael's mom, dad and sister. So grateful for skype. We all sure got spoiled by them. Noelle had so much fun opening her presents from them and seeing them. Later we went to my parents and spent all day there. And again we were spoiled by my family as well and Noelle loved opening her presents from everyone. It was such a great day! I know it's late but I hope everyone had a very Merry Christmas. 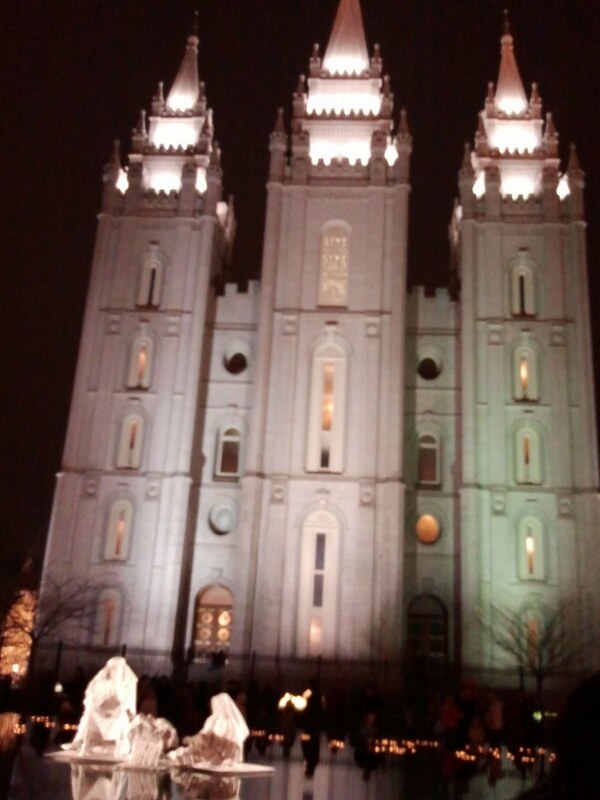 One of my favorite things to do around Christmas time is going to see the lights at temple square. It was especially fun this year because there were four of us. Noelle is at such a fun stage and really enjoyed it. 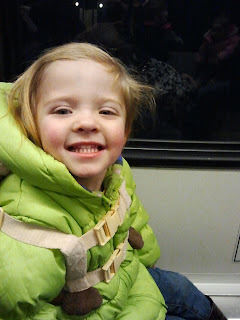 Well mostly she enjoyed the trax train ride there. She couldn't stop talking about it. And will still bring it up to people and tell them "We went on a train to see the lights." It was pretty cold but the kids and Michael were bundled up pretty well. I don't like bundling up all that much because I always go overboard and get too warm. I wish I would have bundled up a little more on this trip. 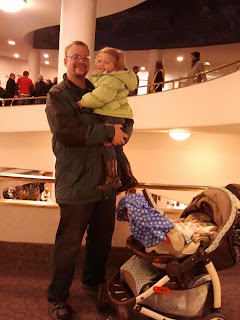 But it was still fun and will continue to be an annual tradition of ours. This year (December 2011) my mom invited Noelle, Mikey and I to go to the Festival of Trees in South Jordan. I went when I was really little with a friend but haven't been back since. I'm so glad we went. There were rows and rows of beautiful trees. First off, if you don't know what it is, it's a Christmas Festival and 100% of the money earned goes to Primary Children's Hospital. The trees are decorated and sold at a silent auction. The trees are pretty awesome. Some are simple, some come with ornate decorations, others come with actual furniture and toys. There is just a huge variety. And you just go up and down the isles looking at them. 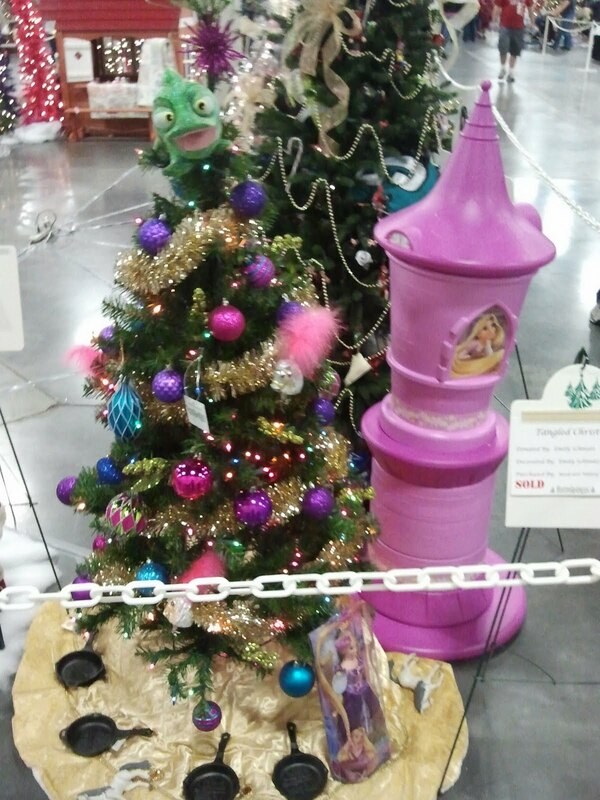 There are also elaborate wreaths decorated and auctioned off as well. 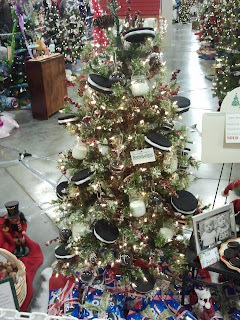 There was also a few small boutiques and fudge and treats and activities for kids. It was sure fun. Very crowded however. So I'm glad my mom was there with me or there is no way I would have gone by myself. Really I promise. An updated post coming very soon!